Sunken, ancient gravestones leaning in different directions. The occasional pair of feline, glistening eyes coming from the shadows of the overgrown grass. The Jewish Cemetery in Worms, Germany, could be straight out of a horror film. It has been closed to the public a long time ago. However, you can still see its spookiness from outside the gate. Nice picture, have a good Monday, Vanessa. That must be an old cemetery. Those headstones look ancient! Ahh a black cat. One of the most misunderstood animals there are. Look at the thick moss on those tombstones! Just right for the month of Shocktober. Have a marvellous Monday. At a cemetery - nice! Lovely photo. Black kitty looks stunning! I love cats and love cemeteries. This is going to be a great month! Gawjus kitty. What a name fur a town. Worms? Strange name. Pretty kitty though! Creepy pic! Beautiful kitty though! What a beautiful and stunning shot of that little panther! 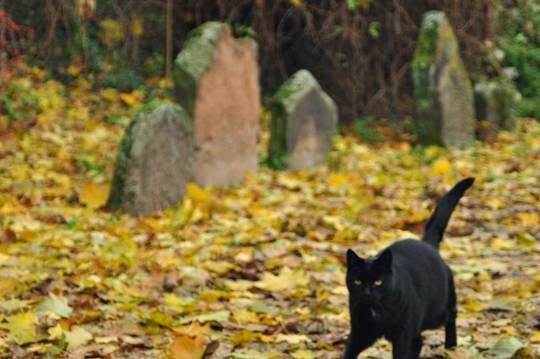 Why are black cats around the cemetery? Où vas-tu joli chat noir ?